Our objectives for today are simple - check out the market and lunch at Piazza Duomo and to get the day underway, naturally enough, we need coffee. 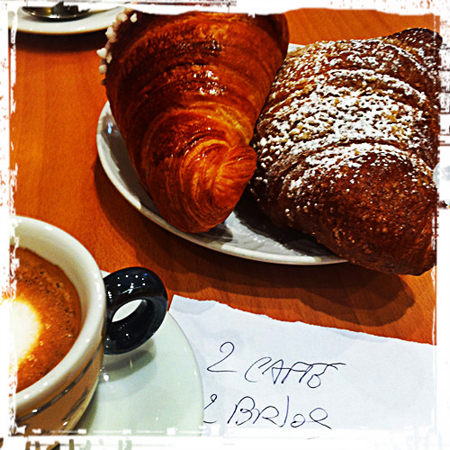 Oh how we've both missed the macchiato/brioche combination and in Alba there's no shortage of cafes to try out. No photos of the market for now - don't want to appear to be too much of a tourist. First impressions are very positive - large selection of stalls selling all sorts of things, from clothing to cookware to plants as well as fruit and veg, augmented by deli, meat and fish vans. We spend a few minutes trying to work out where the proper farmers market was before realising that it was just outside the city walls. It's here where you find the local growers - while there might not be the variety of the other market, you'll get food from the area. It's here that I seemed to have attracted the attention of one of the local characters. 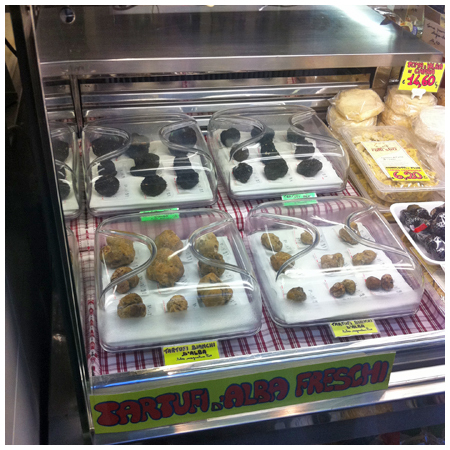 While he took me from to stall, he asked if I was interested in truffles - Of course I was! He went back to his stand and retrieved a hidden jar, opening the lid, he got Paalo to open his hand and poured out a motherload of truffles. For us, 10 euro the lot! You can't help but madly giggle at the price but on the walk back to our apartment you can't help but get annoyed when you think of the ridiculous prices we pay for Australian grown black truffles. What's worse is that the industry tells us that their price is on par with Europe - that is utter rubbish and plays on the naivety of the Australian public. The Australian price has nothing to do with the European price, it's more to do with recouping the capital cost involved in trying to grow the truffles. This last year the gouging was particular bad - the appearance of the much hyped, pop-up, rip-off truffle shop with prices from $2500 to $3500 a kg left us gobsmacked and as much as we love truffles, we don't love being ripped off and until the industry starts being honest about their pricing, we have no interest in buying their product. 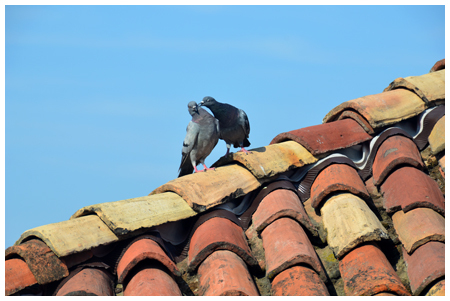 Back in the Apartment, we took a closer look at our treasure, there's going to a lot more truffle meals in our future but that will have to wait - we have lunch at Piazza Duomo to do first. 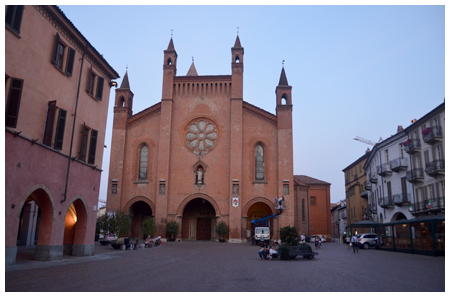 The ringing bells come in handy, letting us know that it is twelve o'clock and time to meander across the piazza for our booking. I've already written about the meal and it effortlessly ranks as one of the best meals we're ever had and rates above anything we've had in Australia. 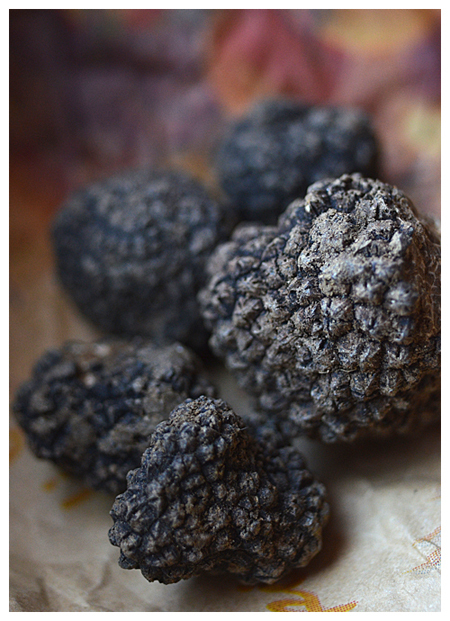 they weren't there yesterday, white truffles are now available! I do manage to control my urges, the purchasing will be left for another day, it's not like we are short on truffles at the moment. 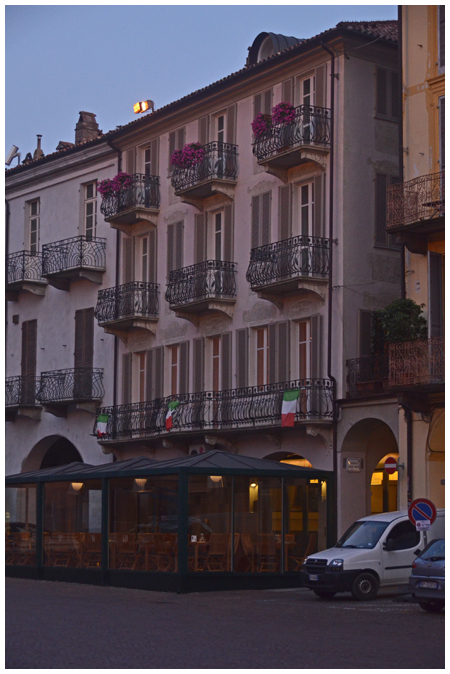 one last shot of the building that houses Piazza Duomo - it's on the floor with the balcony and the Italian flags.